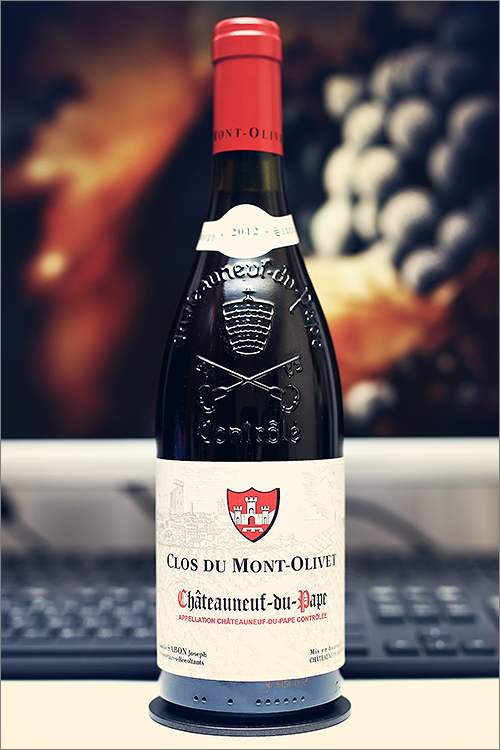 Today we are going to review a one of the most famous wine blends from around the world – Châteauneuf-du-Pape 2012 from Clos du Mont-Olivet. Châteauneuf-du-Pape is the very place where the idea of ‘wines with a sense of place’ was concepted – this was the very first AOC to be recognized when the system was instituted in 1936 in Avignon. There are 19 different grape varieties that are allowed to be used in Côtes du Rhône and Chateauneuf-du-Pape wines, fortunately, of the 19, there are really just three varieties that define the whole style: grenache, syrah and mourvèdre. It’s a natural pairing, since grenache is vigorous and flavorful, mourvèdre is darker and more powerful, while syrah is spicier and fruitier, therefore they are blended together to achieve a more complex and elegant wine. Châteauneuf-du-Pape means ‘the Pope’s new crib’ – it got its name when Pope Clement V moved his headquarters from Rome to Avignon in 1309, but enough theory, let’s get straight to the tasting and find out how good this wine is! Pale copper color, with hazy ruby hues and hints of brick color towards the rim of the glass. The nose is strong, filled mostly with ripe red fruits: sour cherry, ripe red cherry, red plum, cranberry, redcurrant, pomegranate, marionberry, wildberry, red mulberry and ripe boysenberry. An instant later the nose is filled with noble and elegant notes of red pepper, nutmeg, red tea, cherry seeds and some subtle hints of allspice. The wine is dry, with high alcohol level, high acidity and fine tannin. It feels fruity, complex and firm, with a nuanced tannic sharpness on the palate. This is a quite angular and a bit aggressive wine, with a touch of alcoholic warmth showing through. The wine has a fair overall balance, as it tastes elegant and supple. It has a medium-plus finish and an balanced, fruity yet sharp aftertaste. This is definitely a great Wine of France and the overall rating says the same, with 90.4 points scored it is right there, among the best wines we’ve tasted so far. Please click on the chart icon on the left in order to get to the wine rating page, where you can find all the wines we’ve tasted to date. Conclusion: this is a very noble and well structured old-world style wine, that is just about to reach its prime form, as it requires at least a couple more months of bottle ageing (3 to 6 more months will suffice) due to its overwhelming angularity. It has an appealing tannic grip on the palate, with a fine-textured character on the mouthfeel and a touch of alcoholic warmth showing through, which makes it an ideal food pairing partner. Therefore, we would recommend to pair it with slightly spicy dishes rich in umami flavours, like for example a pan-seared filet mignon with garlic and herb butter or a butter-basted garlic and herbs dressed skillet steak in order to better round up all the angularity in the wine. Salute!